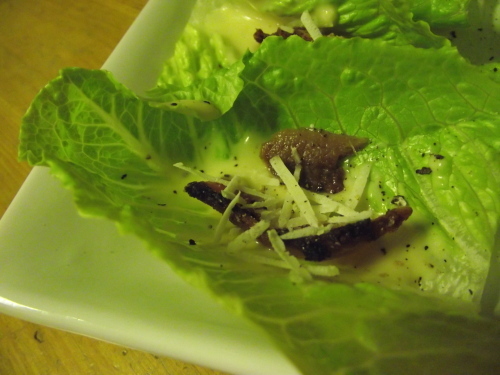 Who ever said Caesar salad couldn’t be finger food? That’s just crazy talk as far as I’m concerned! These are not only ridiculously easy but look great and add a lighter touch for the often heavy appetizer options as well. This makes about 2 dozen bite sized pieces with enough Caesar dressing left over to make a full sized salad the next day with all of the left over Romain. Blend all ingredients together, cover and let chill in fridge until use. 6 slices thick cut bacon cooked semi crisp and then while they’re still warm cut in half and then cut the halves lengthwise for a nice long thin strip. about 8 anchovy fillets (about 3/4 of one small tin) cut into 3 pieces each. Gently pry apart Romain hearts, wash and trim off bottoms so that you are left with a little scoop about 4-5 inches long from the top of the leaf. with a spoon dab a little blob of dressing in the center of the leaf and smear it along the whole spine. Lay one strip of bacon along the spine and one piece of anchovy. Sprinkle with Parmesan and fresh black pepper. If you ware wanting to prep these ahead of time, do the bacon, chop the anchovies, grate the parm and make the dressing and it can all sit in the fridge until you are ready. Separate the leaves and cut to size and then lay gently in a container in the fridge with a damp paper towel instead of a lid or saran wrap. Do not dress them any sooner than 45 minutes before you need them or they won’t be crisp.